If you are not satisfied with any of our products for any reason, please contact us within 30 days and we will make it right. If we cannot make you 100% happy, we will gladly refund your entire purchase! Bold contrasting colors will provide the best visibility for your products. It's best to keep important text/graphics away from the edges of your product, please stay within the printable area of our templates for best results. It is OK to flood your main background color or pattern all the way past the edge of the product (also called "full bleed"). This will ensure that entire cap is covered with your graphic, and not leave any natural color of the cap exposed. Whenever possible, vector graphics stored in files such as EPS, PDF, or AI will provide the sharpest and clearest results. If you must use rasterized images stored in files like JPG, PNG, or BMP, please save them with a resolution of at least 1000x1000 for lens cap products, and 2400x2400 for cleaning cloth products to ensure the best quality. If you have concerns about your graphics, please contact us before you place you order, and we will be happy to help you make sure they are optimal. Due to the wide differences in monitor calibrations, colors represented on this website are for reference only, and may vary slightly on the final product you receive. If you are doing a 100% Custom product, and wish to match specific colors, please indicate those colors in the file you upload to us, or by email, or both! How do I order a cap without LenzBuddy.com printed on the front? If you wish to order one of our caps without the LenzBuddy.com web address printed on the front, simply choose our 100% custom products and upload your own design, or choose Personal Info products, but fill in the Top/Bottom text fields with (BLANK/NONE) and we'll be sure to keep clear! The bigger the better! If you wish to order a large quantity of any of our items, please contact us with the product and quantity for possible volume discounts that may be available to you. We do offer group buy deals for your camera club, or forum. Please contact us with the products you are interested in, and anticipated order size, and we will work to develop a custom group buy in our store for your members. We do have affiliate programs available for you to market our products through your own website. For more information please contact us. We currently stock the most popular sizes of front lens caps. Should you need a different size for your lens, please contact us and let us know, if there is a way to get you one, we will! Our caps are built tough, and are designed to be used just like the original ones that came with your equipment. If you need to clean your cap, water and a soft rag work great. If you have tougher grime to remove, try using a small amount of rubbing alcohol instead of water. Make sure there is no moisture or residue left on the cap before placing on your gear. LenzBuddy™ is not responsible for any damage to your equipment in any situation, for any reason! Seems like an oxymoron, but yes - your microfiber cleaning cloth should be cleaned every now and then. It's best to wash in warm or hot water with mild detergent. However, DO NOT use fabric softener, it will clog the open spaces in the microfiber that do the cleaning and render the cloth useless. For best results, wash the cloth by itself - otherwise you run the risk of it attracting particles from other items being washed. That microfiber stuff doesn't fool around! Our caps and customization process are quite durable. Your personalized cap info will not flake or peel off under normal use. In fact during our testing, we had to take a razor-sharp box cutter and gouge the cap before we could remove any significant portion of the printing! Are these caps just stickers? Do I get the whole cap? Our products are not a cheap paper or vinyl sticker with printing that will rip or flake off. All of our lens and body caps are made of durable plastic and metal materials, that provide a superior surface on which to print with UV hardened inks that will last an extremely long time. You get the whole cap when you order. We stand behind our 100% Money Back Guarantee, so if you think any less of them once they are in your hands, send them back and we will refund your purchase ASAP! Whats up with all the Canon gear on the website? Where's Nikon, Sony and Others? Relax! We provide custom products for a variety of brands of photo gear. When doing photography for our website, we flipped a coin on which brand to illustrate with, and Canon won. 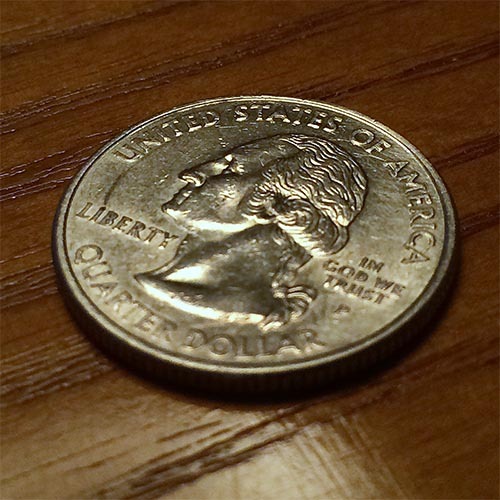 If you have issue with the results, you can blame this quarter. My gear stopped working! Your products broke it! By using LenzBuddy™ products, you are accepting all risk and responsibility to your gear. LenzBuddy™ will in no circumstances be held liable for any damage, malfunction, or incident arising from the usage of our products. While we can't fathom how correct use of our products would cause such issues, rules are rules! Is the Lens/Camera pictured included with my order? Hey... not so fast there partner! Our products are shown on lenses and camera bodies to help show you how great they will look on your gear. Unfortunately, due to economic factors, we are unable to include any such gear with your orders.